The idea for this ceremony came from Paul Rousselle, a former student of mine and a member of the original Peace Mala Youth Team which was formed at the start of the project during the aftermath of 9/11. Paul is currently studying Religion at the University of Wales, Trinity Saint David Lampeter. 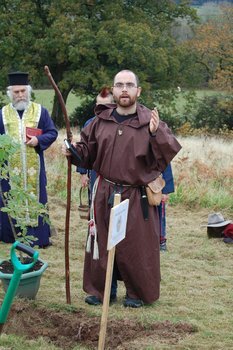 Paul was researching peace messages and golden rules linked to native people when he found an interesting Iroquois ceremony called ‘The Tree of Peace’. 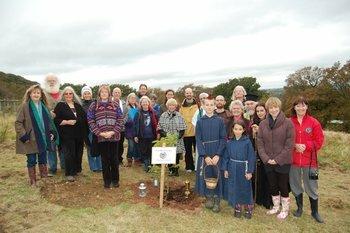 During this ceremony the nations came together, dug a large hole, threw in their weapons and planted a tree above them as a seal to their peace agreement. 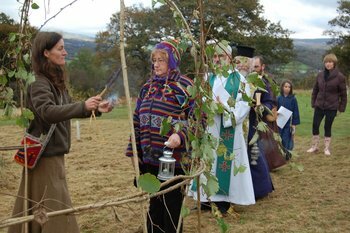 The tree used for this ceremony was an Eastern White Pine, a tree the Iroquois hold special affinity with. 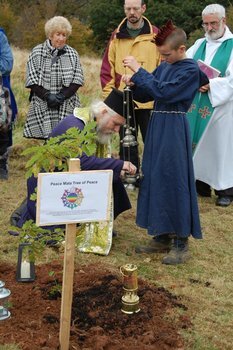 Paul suggested that a similar ceremony would be appropriate to celebrate Peace Mala’s tenth year. 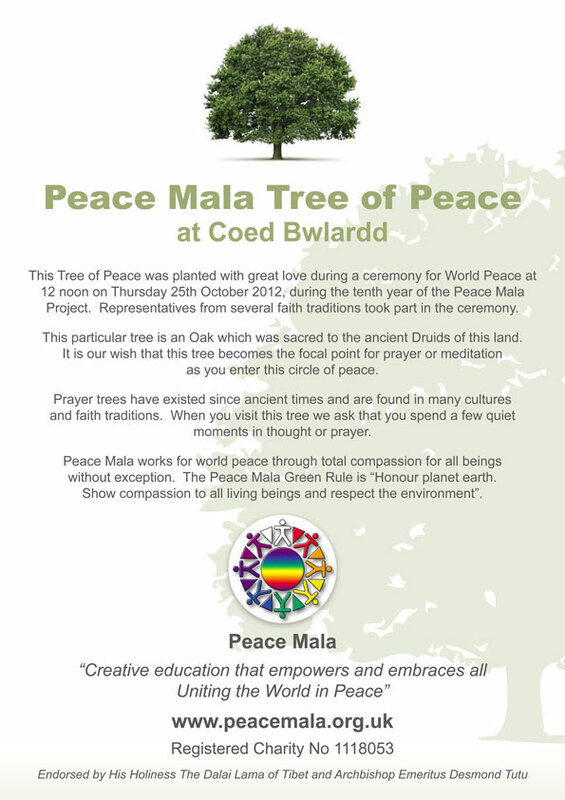 The Trustees and supporters of Peace Mala all agreed that this was a wonderful idea. 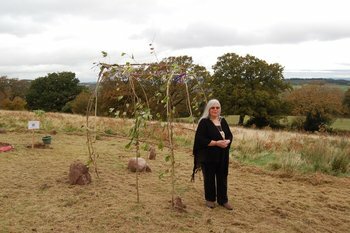 Plans for our Tree of Peace Ceremony finally took positive shape thanks to the kind offer made by Ruth S Davies (Peace Mala’s Tribal and Native Traditions representative). 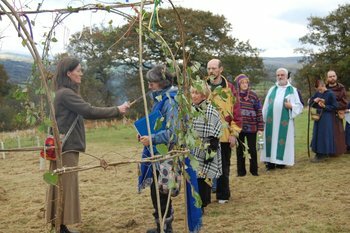 Ruth suggested that the ceremony and tree planting could take place at Coed Bwlardd in Carmarthenshire, an area of land that Ruth and her family are taking care of. Buildings with low environmental impact are being created using timber harvested sustainably from the woodland, and several gentle paths have already been developed for community access and Forest School activities. The work at Coed Bwlardd is to conserve and enhance this area of natural beauty. 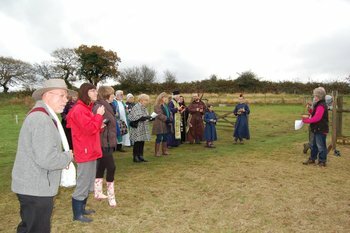 A suitable spot for the ceremony was located on the high ground of Coed Bwlardd which has stunning views of the distant Black Mountains and Carreg Cenin Castle. We decided that our tree of peace would form the focal point for a circle of peace. 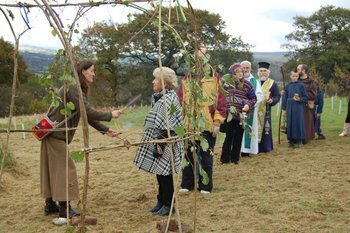 A month before the ceremony, the ground was prepared and a welcoming entrance arch was made from willow by Malcolm, Ruth’s son. Stones representing the beads of the Peace Mala bracelet were collected to form the outer edges of the circle. 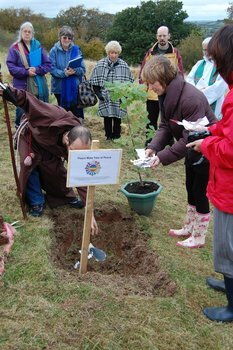 An eight year old Oak tree was donated by Val and John Higgon for the ceremony. 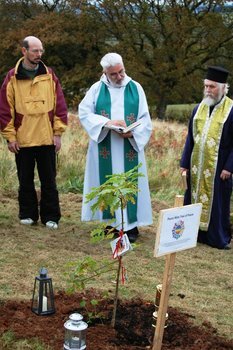 This noble and most sacred tree will have plenty of room to grow into maturity and will remain as an enduring and visual symbol of the vision of Peace Mala. Representatives of the faiths were invited to join us and contribute to the ceremony with prayers, blessings and mantras of peace. 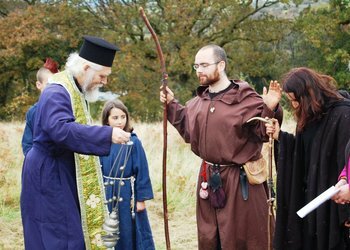 Ruth requested that the blessed lights of Saint Brighid, Saint David and the World Peace Flame also be brought to the ceremony. 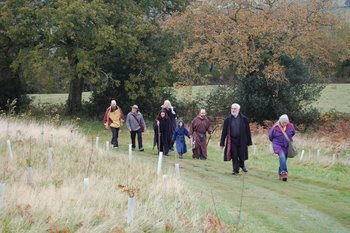 These had been collected earlier in the year to bless the start and end of the Peace Mala Gower Pilgrimage for World Peace. We decided that the ceremony would take place on Thursday October 25th 2012. All who agreed to take part were asked to meet at 11.30am in readiness for the start of the ceremony at 12 noon. A simple meal of hot vegan vegetable soup and breads would be provided after the ceremony. This would be shared around a camp fire. Local Peace Mala Schools were contacted to see if they wished to be involved. Carol Bassett, Headteacher of Catwg Primary School in Cadoxton Neath responded immediately to say that she and Liz Broom, the school’s Special Education Needs Co-ordinator, would attend. The pupils would make small Peace Mala doves with personal prayers, and messages of peace on small scrolls. These could be placed in the willow arch of welcome at the end of the ceremony. 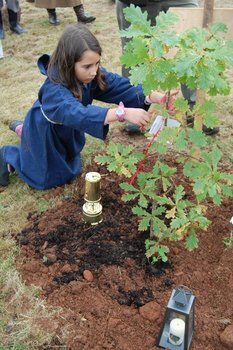 Pupils would also make symbolic drawings of weapons of war that would be placed into the ground beneath the tree. Those who attend would be invited to throw a small pebble that symbolised a personal problem, grievance or regret into the hole. This would represent an act of personal reconciliation. In this way everyone present would be actively involved in the ceremony. 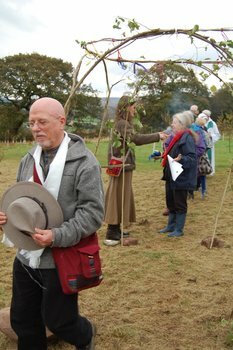 Before we entered the circle of peace, the Native tradition of ‘smudging’ with white sage would be offered to those who wished to receive it. We watched the long range weather forecasts to see if the ceremony could take place. After so much rain, the area was already very muddy and more rain would have made everything impossible. The Thursday of our choice promised to be dry but cold, so we decided to go ahead. What took place had to be one of the most profoundly beautiful and deeply spiritual ceremonies involving people of different faiths ever witnessed. We all felt that we had experienced a miracle. The following order of ceremony gives you some idea of what happened. Smudging with white sage (a Native Canadian/American tradition of healing and blessing) was offered to all who enter the circle through the welcome arch. 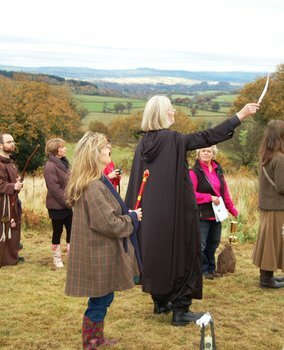 Symbolic weapons of war were placed in the prepared ground by Paul Rousselle (Bard of The Order of Bards, Ovates and Druids), assisted by Carol Bassett and Liz Broom from Catwg School. 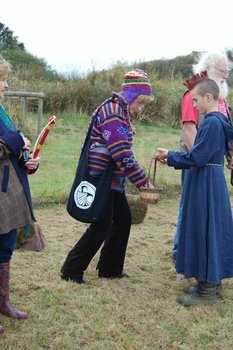 Small stones and pebbles were offered to all present by Gwydion Kavanagh (Gwyddon Earth Religion). The stones represented a personal problem, grievance or regret and were placed into the hole to represent an act of personal reconciliation. Tobacco was offered to the soil by Claire Edwards (a Native Canadian/American tradition which Claire explained the significance of). A libation of cider was offered to the four quarters and the elements by Thomas Corum Caldus. John Higgon (representing The Kagyu Lineage of Tibetan Buddhism) offered blessed Mani pills from Lama Rabsang who was unable to attend as he was travelling to Tibet. 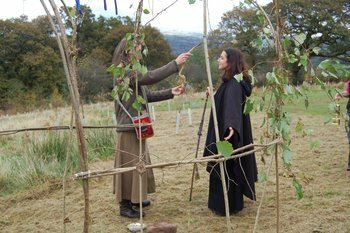 Erin Kavanagh (Gwyddon High Priestess) blessed and honoured the four quarters and made an offering of honey. 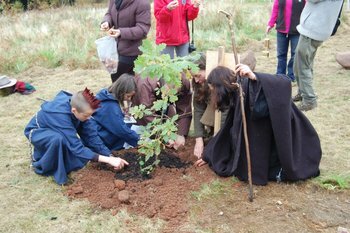 The young Oak sapling was placed into the prepared ground by John Higgon and Leighton Edwards and the earth put in place. Tulip peace bulbs from the Valentine Peace Project were planted around the tree. 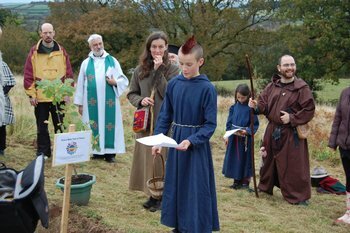 The blessed lights of Saint Brighid, Saint David and the World Peace Flame were placed near the tree and the prayer linked with the lights said in Irish, Welsh and English. 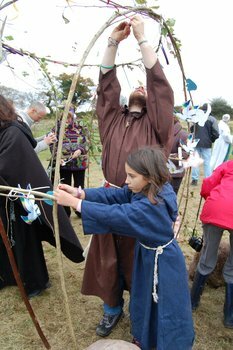 A small Peace Mala bracelet was placed on the tree by Esmeralda Kavanagh (Gwyddon Earth Religion). 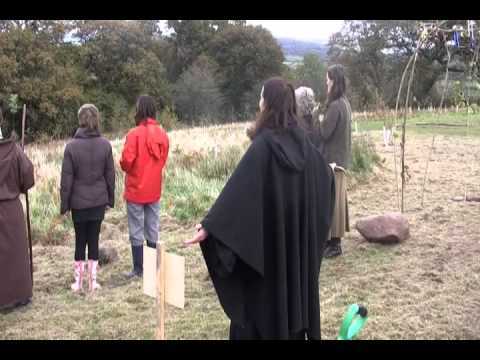 An Inspirational Gratitude Chant for Gaia was given by Faith Challinor-Wheatley (Sound Healer). 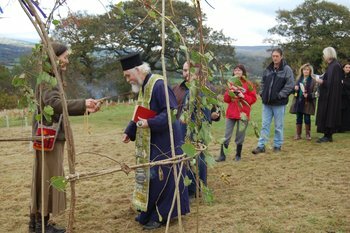 A prayer for World Peace and a Celtic Blessing was given by Revd Alan Bayes (Anglican Church in Wales). Closing words were given by Pam Evans (Founder of Peace Mala). Pam was stopped in mid flow by horses in the lower field that started neighing loudly and looked straight at us in the most riveting way. We took it as their contribution to the ceremony. Red kites and a buzzard were also spotted flying overhead. 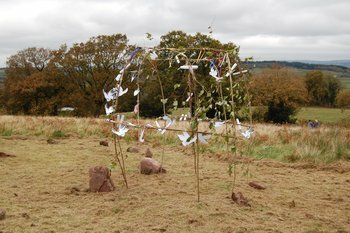 Peace messages (written on small scrolls) and small paper doves of peace made by the pupils of Catwg Primary School were placed into the willow welcoming arch. 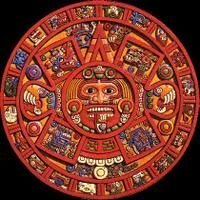 “Both the Hopis and Mayans recognize that we are approaching the end of a World Age. In both cases, however, the Hopi and Mayan elders do not prophesy that everything will come to an end. Rather, this is a time of transition from one World Age into another. The message they give concerns our making a choice of how we enter the future ahead. Our moving through with either resistance or acceptance will determine whether the transition will happen with cataclysmic changes or gradual peace and tranquillity. The same theme can be found reflected in the prophecies of many other Native American visionaries from Black Elk to Sun Bear “ — Joseph Robert Jochmans. This living prophecy is not about one day a light will suddenly be turned on, rather this is about the process we are in now, that will keep steadily unfolding. The essence of this time of prophecy is that we are living in a time of crossroads; a time of shifting world age cycles where the old world and its separation-based mentality is in the process of dying and transforming into a new world that lives and creates through our hearts. An important theme is the reminder that “it is always darkest before the dawn”. In other words, it is said that if we can navigate through these times of immense challenge and crisis, the eventual renewal of the world cycles will bring a gradual return of wisdom and balance. May it be so and may the global family of Peace Mala continue to grow and bring hope to all the peoples and beings of our world. Tekanawita, the Peacemaker, brought the original Five Nations Iroquois Confederacy under a constitution of peace in the 12th Century (Great Law of Peace). Eagle Hill, located in Tyendinaga, is said to be where the Peacemaker was born. The use of symbolism within the Iroquois culture dates back to before the Peacemaker and the establishment of the Great Law. Among the Iroquois, the power of their symbolism is profound because by their use they fed their minds and guided their actions. Circle – The very shape of the logo is in itself significant. Being round, it represents the cyclical world-view traditionally espoused by the Oneidas. Within the border are the words, “Sovereign Nation of the Oneida”. On the newer and more simplified version, the wording and many of the symbols were deleted but the meanings still remain within the tree of peace. The concentric circles represent our eldest brother, the Sun, and our grandmother, the Moon. All of the elements are depicted within a circle which represents the Circle of Life. 1822 – At the bottom of the circle on the older logo version is the year 1822 which marks the Oneida’s moved to this area from New York at which time they signed a treaty with the Menominee Nation. Eagle – The eagle at the top of the tree is the strongest and largest of all birds. He is ever watchful over the Oneida Nation and the Confederacy and warns of danger. He also carries messages to and from the Creator. 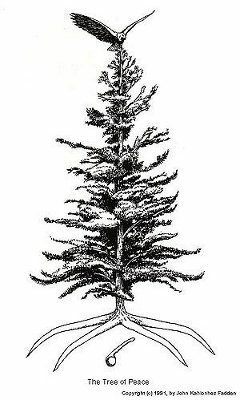 The Tree – The tree is a White Pine which represents the law and peace among the nations. In the Iroquois language there is no term to separate peace and law. It is a way of life characterized by wisdom and graciousness. 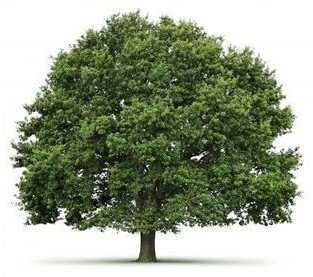 The branches of the tree signify shelter, the protection and security that people found in union under the shadow of law. The Roots of Peace – The four roots on the turtles back spread to the four directions to remind the people that whoever would seek the peace, protection and solace of the Confederacy, they need only trace the roots back to their source and take shelter there. They would discipline their minds to always consider the way of life of all of the people. The tree sits on the back of the turtle because in the Creation Story, Sky Woman fell from the sky and landed on the back of the turtle, and over time, it became what we now call the Great Turtle Island (the North American continent). Clans – The three clans of the Oneida Nation are the bear, the wolf and the turtle. The Bear Clan people are the keepers of the medicines. The Wolf Clan people are the path-finders. The Turtle Clan people are the caretakers of the land. 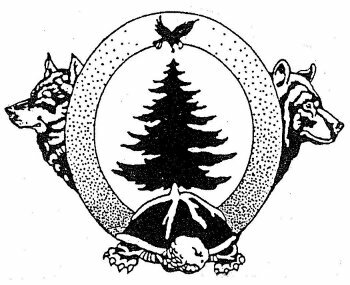 The tree stands on the back of the turtle, symbol of the Great Turtle Island which to the Iroquois people signifies the North American continent. Wampum Belt – The belt represented in the tribal logo is the Oneida Tribal Belt which was created shortly after the Revolutionary War to commemorate the reunification of the Haudenosaunee, (Iroquois Confederacy). It readdresses the commitment of alliance between the nations. The Oneida Tribal Belt and seven original treaties were entrusted to the care of Elijah Skenandoa, a Turtle Clan Chief of the Oneida nation, who brought it to Wisconsin in the 1830’s. Sometime after his death, the belt and treaties were found in the safe in the post office at the Oneida Reservation. Today the Oneida Tribal Belt is at the Field Museum in Chicago pending a repatriation claim for its return on behalf of the Oneida communities. The Weapons – The six arrows bound together represent the commitment of the five nations. (Originally there were five arrows. The sixth arrow was added when the Tuscarora Nation joined the Confederacy.) One arrow by itself can be easily broken, but by binding the arrows together, their strength is multiplied. No nation is allowed to pull their arrow from the bundle. This symbol is profound in the fact that the U.S. Government took this idea and used the bound arrows symbol on the back of the dollar bill to represent the unity of the original thirteen colonies. The war club, along with the bound arrows, are depicted buried beneath the tree of peace, a further affirmation of peace. The newer logo no longer uses weapons. The Peace Pipe – Although the Iroquois men were renowned for the quality of the clay pipes they made and were indeed the basis of the pipes later used by the whites, it remains unclear why the long stem pipe was used in the original logo design. The early Iroquois pipes were made of clay or stone, usually with some type of figure carved on the bowl representing humans, animals or birds. The “peace pipe” was more symbolic of the type used by many of the western nations. The Oneidas are a proud people. They fought on behalf of the Colonies in the Revolutionary War and they fought for America in every subsequent war. The Oneida Nation was among the first allies of a fledgling United States, although now they are scattered from New York to Canada to Wisconsin as a result of the throes of history. It is clear through ongoing research that the Oneida Tribe of Indians of Wisconsin has maintained its cultural knowledge, its pride in its heritage, and its awareness of its traditional legacy and responsibility to the people. The logos, both past and present, signify that knowledge and that pride. Previous Previous post: What is a Peace Mala school?